Since August, AMD has been slowly releasing microarchitecture details about Zen. Initially it started with a formal disclosure during Intel’s annual developer event, the followed a paper at HotChips, some more details at the ‘New Horizon’ event in December, and recently a talk at ISSCC. 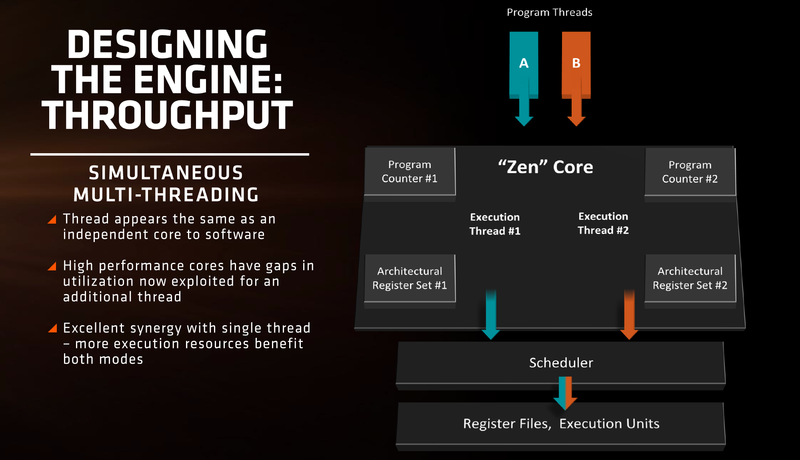 The Zen Tech Day just before launch gave a chance to get some of those questions answered. 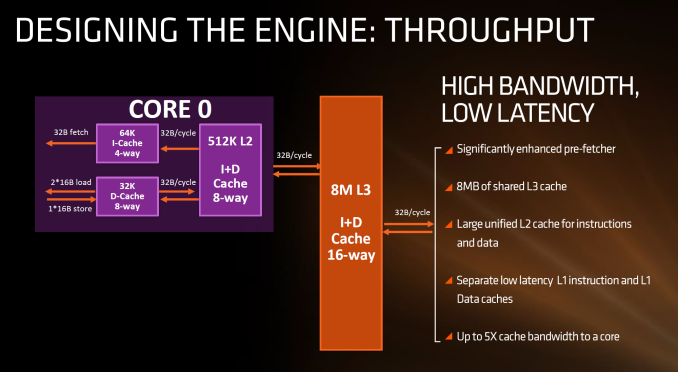 If it looks somewhat similar to other high-performance CPU cores, you’d be correct: there seems to be a high-level way of ‘doing things’ when it comes to x86, with three levels of cache, multi-level TLBs, instruction coalescing, a set of decoders that dispatch a combined 4-5+ micro-ops per cycle, a very large micro-op queue (150+), shared retire resources, AVX support, and simultaneous hyper-threading. First up, and the most important, was the inclusion of the micro-op cache. This allows for instructions that were recently used to be called up to the micro-op queue rather than being decoded again, and saves a trip through the core and caches. Typically micro-op caches are still relatively small: Intel’s version can support 1536 uOps with 8-way associativity. 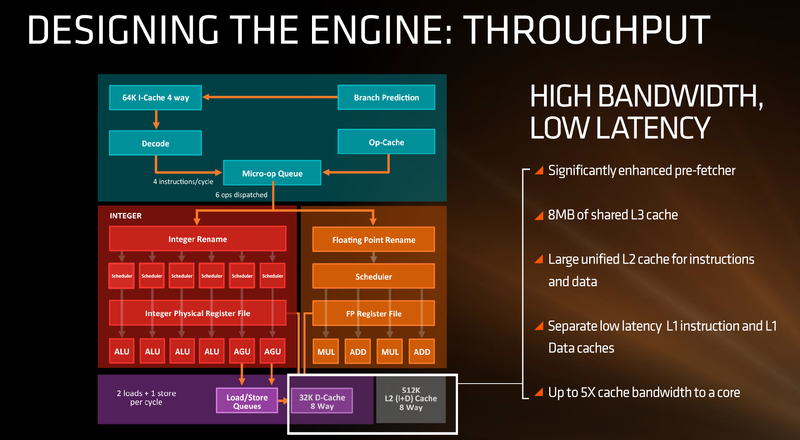 We learned (after much asking) at AMD’s Tech Day that the micro-op cache for Zen can support ‘2K’ (aka 2048) micro-ops with up to 8-ops per cache line. 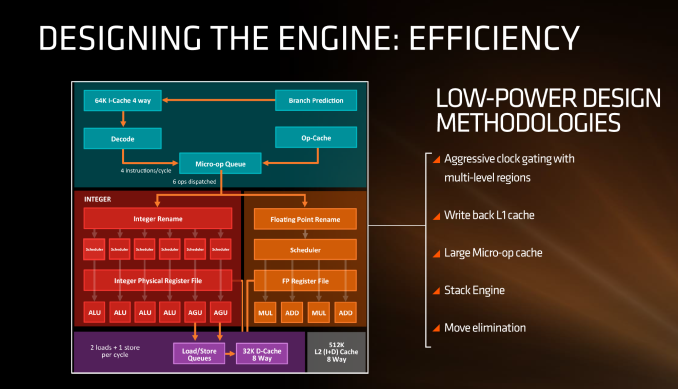 This is good for AMD, although I conversed with Mike Clark on this: if AMD had said ‘512’, on one hand I’d be asking why it is so small, and on the other wondering if they would have done something different to account for the performance adjustments. But ‘2K’ fits in with what we would expect. 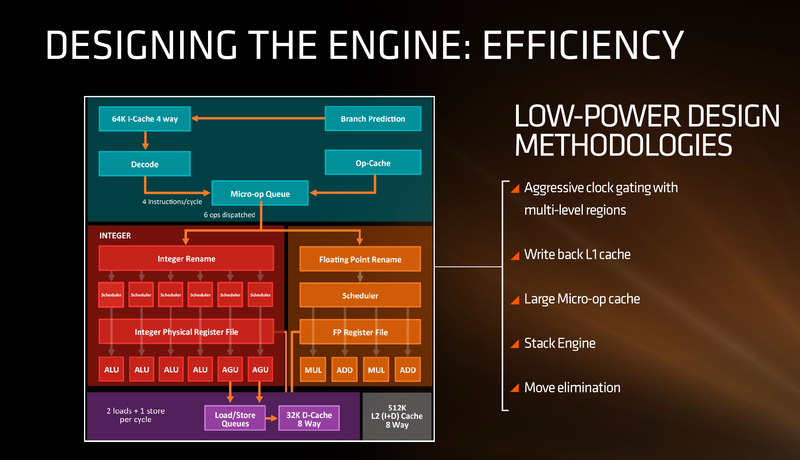 AMD is also playing with SMT, or simultaneous multi-threading. 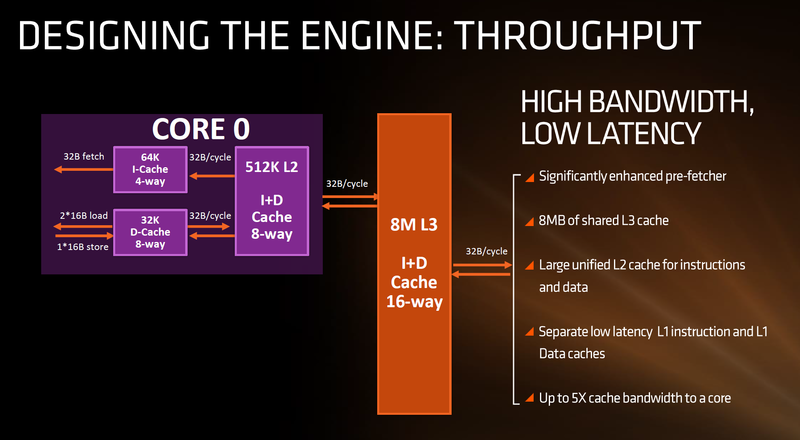 We’ve covered this with Intel extensively, under the heading ‘HyperThreading’. At a high level both these terms are essentially saying the same thing, although their implementations may differ. Adding SMT to a core design has the potential to increase throughput by allowing a second thread (or third, or fourth, or like IBM up to eight) on the same core to have the same access to execution ports, queues and caches. However SMT requires hardware level support – not all structures can be dynamically shared between threads and can either be algorithmically partitioned (prefetch), statically partitioned (micro-op queue) or used in alternate cycles (retire queue). We also have dual schedulers, one for INT and another for FP, which is different to Intel’s joint scheduler/buffer implementation.